For a private residential site in La Jolla, California, Michael Singer was commissioned to design and construct a sculpture, pavilion, pathway and plantings. A stepped and terraced pathway leads to the top of the hill where the shelter provides a place to view the ocean. The shelter walls are custom redwood trellises planted with vines. Layers of wood beams and trellis, transparent glass panels and planters form the roof of the shelter. A swing bench hangs from brass straps attached to the beams. 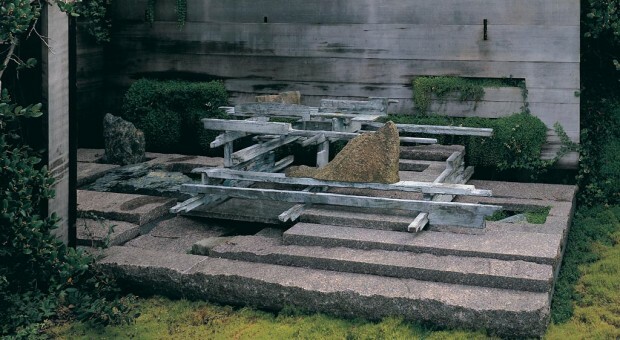 The site for the granite and bronze sculpture, Ritual Series/ Map of Memory 1990, is cut into the hillside; the surrounding earth is retained by a redwood wall containing planter pockets. The overlook landscape is carpeted with low ground covers and mosses that also emerge from within and around the sculpture.